My heart warrior is 4 years old. Isabella is a determined, smart, beautiful, energetic and happy little girl. She’s my miracle baby. However, after three open heart surgeries, countless procedures, and many pokes and prods, it never gets easier. You think that it would and that it would be routine for us at this point. But it never gets easier. When Isabella and her twin sister Olivia were born we were over the moon in love! Five days after the girls were born, we were discharged from the hospital and told to follow up with a cardiologist the following day. The paediatrician heard a murmur in both girls. We heard it was not unusual for babies to have murmurs, so we weren’t overly concerned. So much so that I didn’t even go to the appointment. After taking the girls to their first paediatricians appointment in the morning I opted to stay home. Not even a week from having a c-section my body just couldn’t handle another excursion. So, my husband Vince took the girls downtown with my sister-in-law Lisa, promising to be back in a few hours. Little did I know that those few hours were going to turn into an agonizing few days. The phone call I received from Vince hours later told me something was very wrong. He told me that the cardiologist wanted to do a few more tests on Isabella and that they were going to SickKids. My sister-in-law Susan would pick me up and bring me down so I wouldn’t have to wait at home. He told me not to worry but I knew he was lying. Waiting for Susan to pick me up was excruciating. I knew something was wrong but no one was telling me anything. When we finally arrived at the hospital I knew my instincts were right when I saw my husbands face. My husband is a very strong man and I have only seen him break down a handful of times. He was trying very hard to keep it together but he broke when he saw me. “Something is wrong with her heart babe”. He led me down a hall, passed Lisa holding Olivia, into a room with a bright yellow sunflower on it. I’ll never forget that room. Every time we are in the emergency room at SickKids and I see that door, this memory comes flooding back to me like a ton of bricks. There in the room, filled with about 10 doctors and nurses, lay my Isabella. She looked so small on that big bed, covered with wires attached to monitors. I broke down. Somehow I got put into a chair and was told that my daughter was very sick but that they were going to do whatever they could to help her. The rest of the evening was a blur. Isabella got moved upstairs to CCCU where they were going to do a 10 hour echo. I didn’t even know what an echo was at that point. All I knew what that my baby was sick. How could she be? She was absolutely perfect! That evening was our first of many nights spent at SickKids. Our family and a few friends came down to wait with us. We were given a parent room and my sister-in-law and brother-in-law camped out in the waiting room. The next day we were led into a board room and told the awful news. 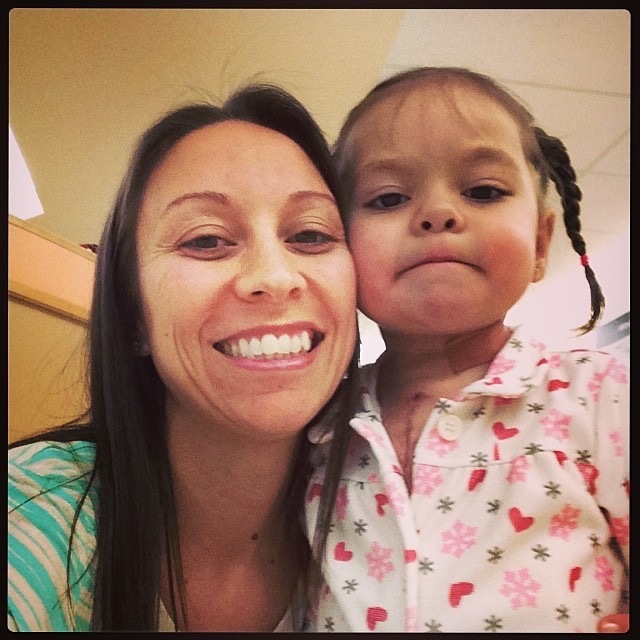 Isabella had a congenital heart defect called Right Atrial Isomerism. It meant that her heart hadn’t formed properly and that she only had one ventricle. She would need 2 if not 3 surgeries in order to survive. This condition also affected her organs, which were oddly shaped and placed and she did not have a spleen. I didn’t hear much after that. I just sat there in shock. Why was this happening to us? How did no one see this? Or did they see it and not tell us? In the end it didn’t really matter. It was happening and I was shocked, terrified, angry and very sad. Most importantly, I wasn’t ready to go home with my heart baby. I wasn’t ready for any of this! Thankfully, we have an amazing support system. My sister-in-law and brother-in-law offered to stay with Isabella on 4D so we could go home with Olivia, break the news to our parents and siblings, and try to get some sleep. It was difficult to leave her but she was in good hands, with people that loved her and would later become her god parents. We knew we needed to take care of ourselves and Olivia because tomorrow was going to be the start of a new life. Our life as heart parents. That day was 4 years ago. However, even after three open heart surgeries, countless procedures, and many pokes and prods later, I remember that day like it was yesterday. Since then Isabella has defied all odds. She dances, runs, swims, sings, plays make believe and simply never stops moving! She is pretty much on par with her twin sister. She is excited to start Kindergarten in the Fall and her hospital appointments are few and far between. When I think about where she was in the first month of her life and how sick she was, I am amazed and grateful at how far she has come. I am thankful each and every day for everyone at SickKids. The surgeons, the nurses, the support staff… We made special connections with her nurses in those first few months and still keep in touch. Those are lifelong friends we have made as they too saw Isabella at her worst and are proud and happy to see how far she has come.